Marshall M. Fredericks Sculpture Museum | Studies for "Dow Chemical Corporation 50th Anniversary Medal"
Reserve: Planets swirling around the universe and Dow logo. Identified in 1983 catalogue for the Fédération Internationale de la Médaille (F.I.D.E.M.) as representative of medals produced for American industry. 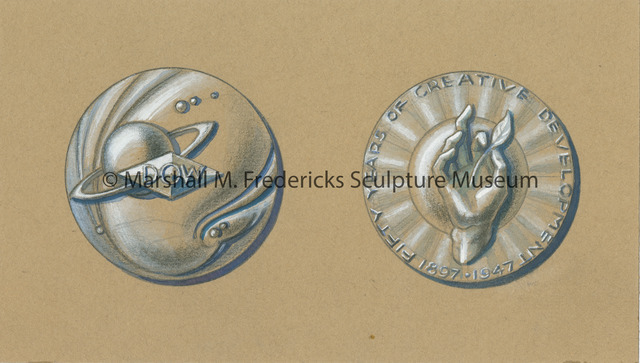 Fredericks, Marshall M., 1908-1998, “Studies for "Dow Chemical Corporation 50th Anniversary Medal",” Marshall M. Fredericks Sculpture Museum, accessed April 21, 2019, http://omeka.svsu.edu/items/show/7516.